The key to success, execution and leadership is composure. In Track, the “worst” moment is the 5 minutes leading up to the gun. Once the gun goes off, the rest is all automatic. Remember that stupid TV commercial for the antiperspirant deodorant? One of the rules of success was “never let them see you sweat”? There is some truth to that statement, including increased antiperspirant deodorant sales! Relax and Win by Bud Winter is in the process of getting updated, so I’ll let you know when that is ready. Staying relaxed and loose is the key to running fast. You are not a caged animal. This isn’t Rome 2000 years ago. I wrote two important articles on this topic, one on how deep breathing can be used to calm and relax you. The reverse, of course, is the effects of stress and IBS. I’ll just review 3 quick tips on How to Stay Cool & Calm Under Pressure. Breathe Deeply. In the “fight or flight” human response, it is normal to start breathing very rapidly and shallow. Read the various methods and timing of deep breathing in this article. Relax your Facial Muscles. Tension is shown in the wrinkles on your face, especially the forehead. You can rub your cheeks or do a big yawn without yawning. In weightlifting, triple Olympic champion (88, 92, 96) Naim Süleymanoglu is a good example where he opens his mouth wide, relaxes, then starts his explosive lift. In gymnastics, 1984 Olympic medalist (parallel bars, team competition) Bart Conner always smiled and wave to the crowd (and judges!) before starting his approach run or routine, which he claimed to help relax his body. So the next time they announce your lane in the PA system, wave to the crowd and give a big smile. 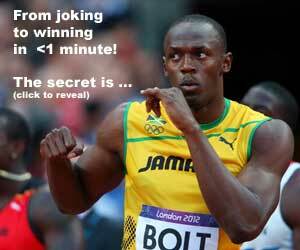 In Track and Field, somehow Usain Bolt’s pre-race routine come to mind? Lower your Voice and Slow Down. When you are nervous, it is common to speak faster, louder, and with more emotion. If you are giving a speech, remember to speak slowly and at a lower pitch. So there you have it. Give these tips a try before your next race. READ How to Improve your 100 meter Start: Quickness vs. Powerful? please help me how to stop blushing.